This information has been prepared by the Public Interest Committee of the Delivery of Legal Services Section, Section of Family and Juvenile Law and the Public Awareness Committee of the Maryland State Bar Association. It is intended to inform the public and not to serve as legal advice. Some of the most frequent questions attorneys are asked involve divorce and separation. Many members of the public have either been directly involved in these types of problems or know someone who has experienced divorce or separation. Often, the parties in these situations try to resolve their problems without legal proceedings. Before attempting to reach an agreement, however, it is important to have a basic understanding of the law in this area. Uninterrupted desertion for at least 12 months, which is deliberate and final and in which there is no reasonable expectation of reconciliation. Parties have lived separate and apart without cohabitation and without interruption for two years. In many instances, the parties to a marriage voluntarily agree to live separate and apart until they can obtain a divorce. 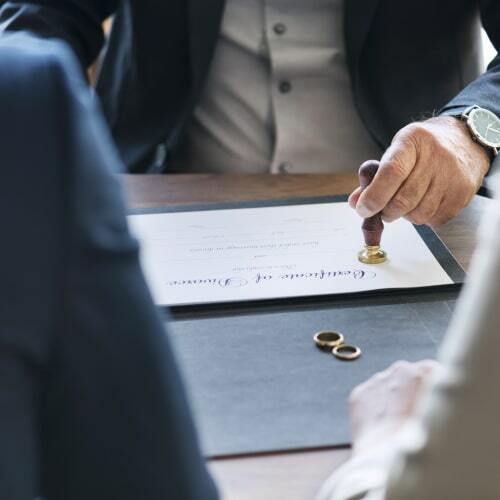 The individuals involved may agree, after negotiation on the parties’ behalf between their respective lawyers, about the division of their property and other questions pertaining to alimony, child support, custody and visitation. The parties enter such an agreement in writing. This document, known as settlement or separation agreement, fixes the rights and responsibilities of the two parties between each other. It is a binding contract between the two parties, which can generally be enforced by appropriate court action. An exception to this exists in matters concerning child custody and child support; the court always retains jurisdiction over these issues. Alimony is payment for support of a spouse. Under the law of Maryland, either party may claim alimony from the other. The fact that the party seeking alimony may be guilty of some ground for divorce does not prevent an award of alimony to that party. Courts are required to consider many factors in determining the award and amount of alimony. These include, in part, the financial needs and resources of the parties, their income and assets, financial obligations, standard of living and the facts and circumstances leading to separation. Courts have always given the highest priority to the needs of children in divorce proceedings. Each party has a responsibility for the support of a minor child or children. A formula called the child support guidelines is now used by the court to determine the amount of child support. Child support awards are primarily based on the gross incomes of the parties, but each case must be considered on its own facts and circumstances. If the parties have reached an agreement on the alimony and child support and have placed that agreement in writing, their agreement will govern payment of alimony and child support unless that agreement was obtained by fraud or under duress. Marital property is defined as all property acquired by either or both parties during their marriage. It does not include property acquired prior to the marriage, property acquired by inheritance or gift from a third party or property excluded by valid agreement or traceable to any of these sources. Whether or not alimony is awarded, a court may still make a monetary award based on the value of all marital property. In determining the award and amount, the court is required to consider many factors. It is important to bear in mind that the court does not have the power to change the title to property, except for pensions and retirement funds, but may adjust the rights of the parties by giving a monetary award. If either party has a pension or retirement fund entitlement, it is essential that an attorney who is knowledgeable about such matters prepare all necessary documents. Maryland courts award custody of the minor children to one or both parties according to what is in the best interest of the children. If the physical custody is awarded to one party, visitation rights will generally be granted to the other party. Decision making power regarding the child or legal custody, may be awarded to either party separately or to the parties jointly. Divorce and separation today is a more complicated process than ever before. Serious questions arise as to each area discussed above. Because the law is complex and ever-changing, it is important to seek legal advice when any questions concerning divorce or separation arise.